Children’s National offers comprehensive nutrition services for children with complex nutritional needs. The program’s team includes international experts in the field, one of the most experienced teams in the country. Our specialists ensure that your child receives the nutrients critical for health, growth, and development. Services include advanced pediatric gastroenterological treatment from a multidisciplinary team that includes dieticians, nurses, physician assistants, and physicians. 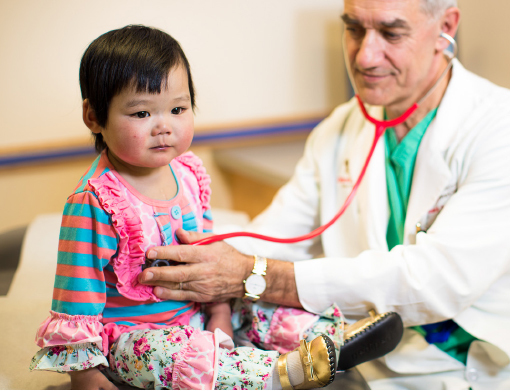 Children’s National gastroenterologists work closely with other specialists to see that the needs of every patient are met, including specialists from the Divisions of Hearing and Speech, Psychiatry, and Developmental Pediatrics. Our Infant and Toddler Mental Health Program provides internationally recognized care for young children with personality, mood and feeding difficulties. The Complex Salivary and Endocrine Surgery Program at Children’s National Health System treats problems that occur when a child cannot control oral and facial muscles. The Program for Health Problems Related to Bullying treats children and teens who are bullied, as well as those who bully others. This is the third in a series about feeding disorders as researched by Children’s National psychiatrist Irene Chatoor, MD.